Losing weight can be a challenge because diets often restrict the variety of foods you can consume. Shrimp provides nutrients such as vitamin B12, vitamin E, niacin and omega-3 fatty acids. Shrimp is also low in saturated fat. As long as you eat shrimp in moderation and control the calorie content of the rest of your diet, you can eat shrimp and lose weight. 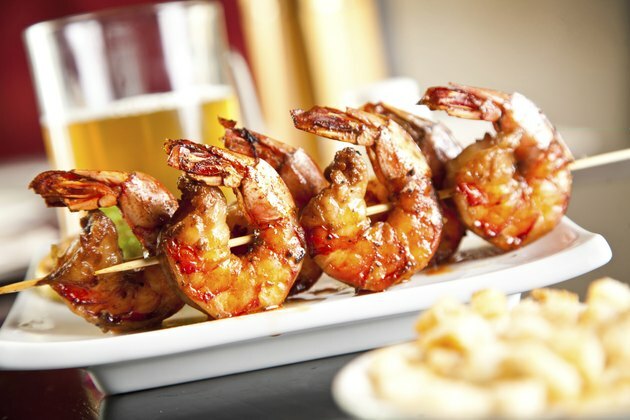 A 3-ounce portion of cooked shrimp contains 101 calories. To lose weight, you need to consume fewer calories than you expend. Low-calorie foods, such as shrimp, can help you limit your caloric intake so that you can lose weight when you choose lower calorie foods instead of choosing higher calorie foods. In comparison, a 3-ounce portion of beef contains 179 calories, and a 3-ounce portion of stewed chicken with the skin on has 242 calories. Focusing on high-volume, low-calorie foods can help reduce your hunger as you cut back on calories to lose weight. In addition to choosing lean proteins, such as shrimp, the Centers for Disease Control and Prevention suggests that you emphasize vegetables in your shrimp dishes. Have grilled shrimp on a green salad or make a stir fry with broccoli, celery and bok choy. Other low-calorie, high-volume dishes that you can make with shrimp include soup with shrimp that's made with low-sodium broth and vegetables, and grilled shrimp with fruit salsa made with orange wedges, lime juice, apple slices and onions. Some recipes with shrimp are high-calorie, but you can modify them to reduce their calorie content and be more conducive to weight loss. Use plain, non-fat Greek yogurt instead of mayonnaise when making shrimp salad or dip. Instead of pasta or potato salad with shrimp, make a salad with cooked shrimp, steamed green beans and garlic, black pepper, thyme and low-fat feta cheese. Use tomato sauce instead of Alfredo sauce for pasta dishes -- and serve your shrimp and sauce with spaghetti squash instead of pasta. Shrimp can help you lose weight because of its protein content. It provides 19 grams of protein in a 3-ounce serving of cooked shrimp. Protein is a satiating nutrient because it digests slowly, so you stay full longer after a meal. You are more likely to lose weight if you prepare your shrimp using low-fat cooking methods, such as grilling or steaming, instead of frying the shrimp. A 3-ounce portion of fried and breaded shrimp contains 206 calories. Centers for Disease Control and Prevention: Balancing Calories: Eat More, Weigh Less?